Bulk email marketing is an email sent to large groups of people at once with the aim of advertising the goods or services provided by a business or simply maintaining the relationship with customers. When done right, it allows to increase the number of loyal clients and boost ROI. The recipient consented to it. The email provides the “unsubscribe” button. The name of the business is clearly shown. If bulk emails satisfy the above requirements, they become effective marketing channels for the businesses that send them. Absence of an “unsubscribe” button. Contain information that is not personalized. Now, businesses ought to be very cautious with bulk email marketing to avoid spamming their mailing lists. An effective email marketing campaign can be achieved by using SendPulse. This service provides the necessary tools to create and automate bulk email marketing tasks. Bulk email marketing is the surest way to go for any business that wants to connect with existing and prospective customers in the shortest time possible. See, this marketing approach allows a marketer to create marketing messages without breaking a sweat. All that one has to do is use the available set of tools and workflows. With that, what would have otherwise taken weeks to implement is accomplished in less than an hour by one person. Given that marketing emails can be created fast, they allow marketers to send “day-of” emails to ensure the timely promotion of a limited time special or inform customers of reduced stock. Bulk email marketing also enables marketers to send real-time emails to consumers that reach them on anniversaries, birthdays, and so forth. It is difficult for marketers to speak to their target customers in a personalized manner via radio, television, or print advertising. Why? Most of the marketing campaigns on these media are often done in a “one-size-fits-all” approach. Nonetheless, bulk email marketing allows businesses to send personalized emails bearing the names of their customers. Moreover, bulk email marketing makes it possible to provide personalized information such as purchase history. Thus, businesses can reach out to people who already have a relationship with them rather than sending out emails to random recipients. With bulk email marketing it is also possible to segment the customer list into a smaller, more effective one, and send out personalized emails. For example, a marketer can identify all customers from say, Los Angeles, and then proceed to create an email marketing campaign that addresses customer needs in that location. So, if a brand is keen on speaking to its customers in a more personalized and intimate way, bulk email marketing is the way to go. Since bulk email marketing allows marketers to segment their customer list and database, they can send targeted marketing emails that significantly boost sales conversions due to their specificity. With this marketing practice, marketers send out appealing messages to specific customers thus increasing the chances of getting a favorable response from them. Since bulk email campaigns are easy to create and launch, marketers can reach out to their customers often. There is absolutely nothing preventing a marketer from sending weekly offers to their prospects and existing customers. And if they wish to send out marketing emails way more regularly than that, they can easily do the same. That said, here is a caveat — it is wise not to send marketing emails to customers more than once a week. For effective marketing, one should test various things. On that note, bulk email marketing allows marketers to see headlines, colors, and graphics that customers respond to the most. It is also entirely possible to send a specific version of an email to part of the mailing list and another version to the remaining part. After that, the marketer can use tracking tools offered by bulk email marketing to determine which marketing message was most effective regarding user actions and sales conversion. Bulk email marketing allows to share the advertising content. People can quickly forward an email containing a piece of information or enticing offer. In turn, this allows a brand to gain advocates who further push the business within their networks. Bulk email marketing can be done at an incredibly low overhead cost. For instance, there is no need for hiring marketing analysts, designers, and many employees. An excellent bulk email marketing strategy only requires an effective email marketing service such as SendPulse and a competent marketer who can provide the right offers, content, and graphics to the relevant customer list. So far, there is no marketing channel out there that offers greater ROI than email marketing. Bulk email marketing comes with useful tools that enable marketers to track information to determine what’s working and what’s not as far as their promotional campaigns are concerned. An excellent email marketing platform such as SendPulse provides useful data. For instance, the number of people who opened an email, the number of those who clicked a link within the email, the particular link that was clicked, the number of people who complained and considered the email to be a spam, the number of unsubscribes, and whether the email at all reached the inbox of the recipient. If a marketer uses this information and tracks sales back, they can determine the customer`s response and engagement throughout the entire cycle with elaborate, and understandable metrics. Identify your target the audience. Marketers should determine the demographic groups that are most interested in the products and services their business offers. One can look at aspects such as nationality, income level, education, age groups, gender, ethnicity, among other demographic characteristics ahead of creating a bulk email campaign. The point is to tailor the marketing emails to a specific market segment. Focus on the benefits. Clearly describe what the customers stand to gain from a particular brand. By highlighting the interests of consumers, a marketer can cause them to respond. Be brief and to the point. A marketing email ought to be concise. See, it is a common habit to the scheme through emails. Thus, the reader should see the important bits quickly enough to allow them to make a decision. Most people lose interest when reading lengthy or complicated emails. Worse still, such emails can be deleted as soon as they are opened. Hence, marketers ought to write concise emails and provide content that centers on the goods offerings of a particular brand. Communicate the deadlines. Show the need for immediate response by mentioning the date the offer expires. By doing this, customers will be kept from any procrastination that at times leads to forgetting. Provide communication channels. Give customers a chance to respond to your email. For instance, a marketer can give a contact number, hyperlink, and so forth that allows the potential customer to conveniently reach out to the company in case of any inquiry. Send emails to people who are interested in your business. Marketers should refrain from buying email addresses. Use an effective email marketing service. Implement double opt-in whereby the subscriber consents to receive marketing emails by replying to an email. Be confidential regarding all interactions with the customers. Never sell their data. Are you more of a visual learner? Check out some excellent bulk email campaigns to get a good idea of the same. 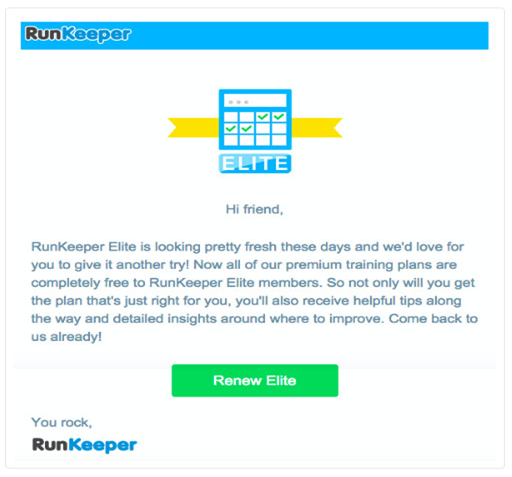 First, an email from RunKeeper. 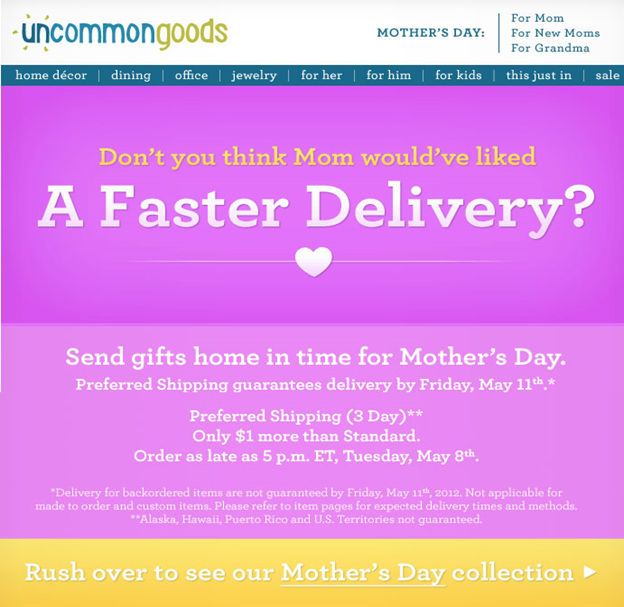 Next, a marketing email from UncommonGoods. Finally, this is how Bonobos is doing it. Take unsubscribes with the seriousness they deserve. Never send marketing emails to people who have opted-out. Once a subscriber has opted-in, have a system in place to let them know that their subscription has been confirmed. Integrate email campaigns with social media. Also searched with "Bulk email marketing"
Rate this article about "Bulk email marketing"
If you are interested in "Bulk email marketing" you might be interested in our bulk email service.